Sensitive and handsome, Nero (37 – 68 AD / reigned 54 – 68 AD) started out well as emperor. But his early promise gave way to wild extravagance and murder. His rule ended as violently as it had begun. 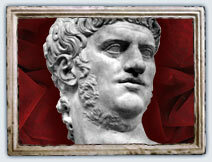 When he became emperor, Nero was a young man who enjoyed the theater, music and horse racing. His dominating mother, Agrippina, had already murdered Claudius to see her son on the throne. She quickly poisoned Nero’s main rival, Claudius’ son, Britannicus. But Nero didn’t want to be controlled by his mother. Encouraged by his former tutor, the writer and philosopher Seneca, he began to make his own decisions. Relations with his mother became frosty and in 56 AD she was forced into retirement. Nero started well. He ended secret trials and gave the Senate more independence. He banned capital punishment, reduced taxes and allowed slaves to sue unjust owners. He provided assistance to cities that had suffered disasters, gave aid to the Jews and established open competitions in poetry, drama and athletics. However, like Caligula before him, Nero had a dark side. His impulses began as simple extravagance. Before long, however, stories were circulating that he seduced married women and young boys, and that he had castrated and "married" a male slave. He also liked to wander the streets, murdering innocent people at random. Both Seneca and Agrippina tried hard to control Nero. Seneca tried to be subtle, but his mother was not. Relations between mother and son grew worse and Nero decided to kill her. 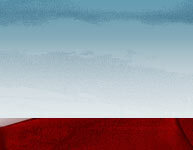 He invited her to travel by boat to meet him at the seaside resort where he was staying. When their reunion was over, Agrippina left for home. She was never meant to get there, but the murder attempt failed and Agrippina swam to safety. Annoyed that his plot had failed, Nero abandoned subtlety and sent some soldiers to complete the job. He claimed that his mother had been plotting against him, but fooled nobody. Rome was appalled. Matricide – the murder of one’s own mother – was among the worst possible crimes. Tolerance of Nero’s depravity ebbed away and Rome faced a series of bad omens. Tacitus wrote, “Unlucky birds settled on the Capitol, houses fell in numerous earthquakes and the weak were trampled by the fleeing crowd." Worse was yet to come. The Great Fire of Rome lasted for six days and seven nights. It destroyed or damaged 10 of Rome’s 14 districts and many homes, shops and temples. Nero offered to house the homeless, but it was too late. A rumor had spread of Nero’s behavior during the fire: although he hadn’t fiddled while Rome burned, he had been singing. With Nero’s mother dead and his tutor retired, the emperor was beyond anyone’s control. Rome was now victim to the arbitrary desires of a mad tyrant: there was only one solution. In 65 AD, one plotter, a freed slave named Epicharis, found a dissatisfied officer who had access to the emperor. She secretly asked him to kill Nero. Instead, the officer betrayed Epicharis and she was captured. Rather than give up the names of her fellow plotters, she killed herself. Not knowing who was involved, Nero redoubled his guard and unleashed terror on Rome. Huge numbers of people, including Seneca, were executed or forced to kill themselves. But Rome had had enough. A revolt in the northern territories quickly spread and the Senate declared Nero a public enemy. This meant that anyone could kill him without punishment. Terrified, Nero fled to the country with his few remaining slaves and killed himself. Without any heirs, the Roman Empire now had no leader. With the ultimate prize up for grabs, rival generals began moving their troops towards Rome and civil war.